The P-1 Hawk (Curtiss Model 34) was a 1920s open-cockpit biplane fighter aircraft of the United States Army Air Corps. An earlier variant of the same aircraft had been designated PW-8 prior to 1925. 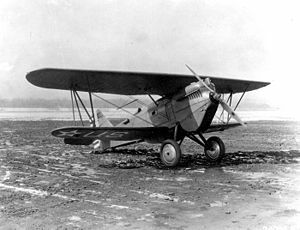 The PW-8 (Curtiss Model 33) had been acquired by the Air Service in 1924 after a competition with the Boeing Model 15, designated the PW-9, to replace the existing Army fighter, the Boeing MB-3A. Although the PW-8 was faster than the PW-9, it was otherwise out-performed by the Boeing plane, and its cooling system appeared to be more difficult to maintain and vulnerable in combat. However Assistant Chief of the Air Service Brig. Gen. Billy Mitchell agreed to purchase 25 PW-8s in return for assistance by Curtiss in making the Dawn-to-dusk transcontinental flight across the United States. The prototype of the P-1, the XPW-8B, came about when the Air Service, which had selected the Boeing PW-9 over the PW-8 as its main production fighter, asked Curtiss to modify one of its three original XPW-8 prototypes with wings resembling those of the PW-9. Curtiss designated the modified aircraft its Model 34A and returned it to the Air Service for evaluation, from which the service ordered it into production as the P-1. The first production P-1, serial number 25-410, was delivered on August 17, 1925, and was followed in successive years by the P-1B and P-1C variants with improved engines. The newest P-1 variants remained in operational service until 1930. The March 7, 1925 order for the P-1 also requested five aircraft with the more powerful 500 hp (373 kW) Curtiss V-1400 engine installed. These were completed in January 1926. The first (SN 25-420) was then modified with a supercharger mounted on the right side of the fuselage nose, and whose turbine was driven by engine exhaust; the craft was designated XP-2. However, the Curtiss V-1400 engine did not perform up to expectations, with or without the supercharger, and so after a year in service, three of the standard P-2 Hawks had their engines replaced with the Curtiss V-1150 and were consequently redesignated as P-1s. The fifth machine (25-243) received a Curtiss V-1570 Conqueror engine and became the XP-6. 93 production P-1s were brought into service in the P-1, P-1A, P-1B, and P-1C variants. 52 other P-1s, variants P-1D, P-1E, and P-1F, were made by conversion of other Hawk variants, primarily At-4 and At-5 trainers. The P-3 Hawk was similar to the P-1 Hawk but with a radial R-1340-3 Wasp radial engine. The first of the type, designated XP-3A, was the last P-1A (serial 26-300). Originally intended to be powered by a 390 hp (291 kW) Curtiss R-1454, the engine was deemed unsatisfactory and the 410 hp (306 kW) Pratt & Whitney R-1340 engine substituted. A second XP-3A (serial 28-189) included a cowling and spinner to reduce the drag due to the radial engine; entered in the National Air Races of 1929, its speed of 186.84 mph (300.69 km/h) gave it second place in the Thompson trophy race. The remaining four craft were production P-3As, but primarily used to service test the Pratt & Whitney Wasp engine. In addition to the significant increase in drag, the radial engine also interfered with the pilot's view. Addition of a Townend ring cowling worsened the visibility problem, and had only a limited effect on speed. It was also tested with various types of deep-chord NACA cowls. Two of the XP-3A aircraft were re-engined in 1929 and 1930 with the Pratt & Whitney R-985-1 Wasp Junior engine. This aircraft was re-designated the XP-21. Tests were run with this aircraft, but it was never developed into a production aircraft, despite the designation. Two single-seat advanced trainer variants were placed into production, the AT-4 and AT-5A, using Wright-Hispano engines. All were re-engined with Curtiss D-12D engines and reverted to use as fighters, designated P-1D and P-1F respectively. Five AT-4/XAT-5 test variants were re-classified as P-1E. A total of 202 PW-8, P-1, P-2, P-3, P-4, P-5, AT-4, and AT-5 airplanes were delivered. On June 23, 1924, taking off at 3:58 A.M., Army test pilot First Lieutenant Russell Maughan left Mitchel Field, New York, in PW-8 24-204, modified with additional fuel and oil tanks, made a dawn-to-dusk transcontinental flight across the US. Refueling five times, he landed at Crissy Field, San Francisco, California, at 9:46 p.m., one minute before dusk, covering 2,670 mi (4,297 km) in 20 hours and 48 minutes. 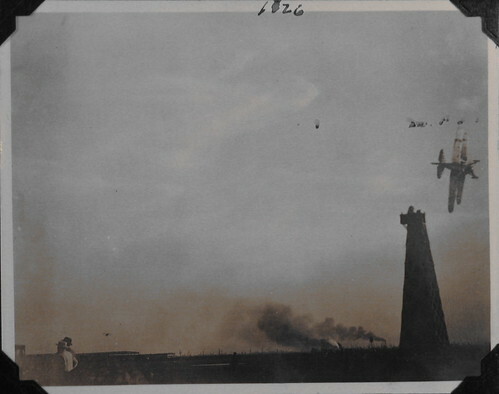 His flight time included four planned 30-minute stops at McCook Field, Ohio; Saint Joseph, Missouri; Cheyenne, Wyoming; and Salduro Siding, Utah; and an unplanned stop in North Platte, Nebraska for additional fuel when a muddy field in Missouri did not permit him to take on a full load. He also lost an hour at McCook to repair a broken fuel valve after an over-eager mechanic had over-torqued the valve, damaging it. The original fifteen P-1s served in the 27th and 94th Pursuit Squadrons, 1st Pursuit Group, Selfridge Field, Michigan. The first Hawk to serve with the Air Corps in quantity was the P-1A (17th, 27th, and 94th Pursuit Squadrons) beginning in 1925. In October 1928 the largest order of 33 P-1s was made. These were delivered by April 1929 as P-1Cs. The AT-4 and AT-5 trainer variants served with the 43rd Pursuit Squadron (School) at Kelly Field, Texas. While a total of 202 Hawks were built in the basic variants PW-8, P-1, P-2, P-3, P-5, AT-4 and AT-5, conversions resulted in 148 having a P-1 designation. 3 manufactured, one modified to XPW-8A and later XPW-8B standard, one converted to CO-X two-seat observation aircraft. Model 34 - The XPW-8A fitted with single-bay tapered wing as prototype for the P-1 series. Model 34A - Production version of the XPW-8B with modified rudder and additional wing center strut, and Clark Y aerofoil, powered by 435 hp (324 kW) Curtis V-1150-1 (D12), 10 built. Model 34G - P-1 with 3-inch fuselage stretch, larger wheels and revised fuel system, 25 built with D-12C engine and three conversions from P-2. Final two converted to XAT-4 Trainer and XP-3 racer prototypes. Delivered in 1926. One P-1A used for development trials. Model 34I - 25 produced with Curtis V-1150-3 (D-12D) engine. Increased weight reduced performance. Delivered 1927. Model 34O - 33 built with Curtis V-1150-5 (D-12E) engine. Increased weight further decreased performance. delivered 1927-28. One P-1C fitted with a revised radiator. 24 conversions from AT-4 trainers, re-engined with Curtis V-1150-3 (D-12D) engines. 4 conversion from AT-5 trainers re-engined with 440 hp (328 kW) V-1150-3 built as AT-4s and converted to XAT-5 prototype. All re-engined and converted to P-1E. 24 conversions from AT-5A trainers, one conversion from XP-21A, all re-engined with a 440 hp (328 kW) Curtis V-1150-3 in 1929. Model 34B - P-1 with a 500 hp (373 kW) Curtiss V-1400, five built. 3 later converted to P-1A and one re-engined with the Curtiss V-1570-1 as the XP-6. Radial engined version, one converted from a P-1A with 390 hp (291 kW) Curtiss R-1454 engine, later converted to XP-3A. XP-3A re-engined with the Pratt & Whitney R-985 Wasp Junior. Model 34N - five production aircraft to the AT-5A design with a 410 hp (306 kW) Pratt & Whitney R-1340-7. P-1A modified with a supercharged 510 hp (380 kW) Packard 1A-1530 engine. P-1A version with a 435 hp (324 kW) Curtiss V-1150-3 engine. Model 34L - four built, same as XP-5 later modified with the Curtiss D-12F engine. Model 34J - P-1A re-engined with a 180 hp (134 kW) Wright-Hispano E as an advanced trainer. 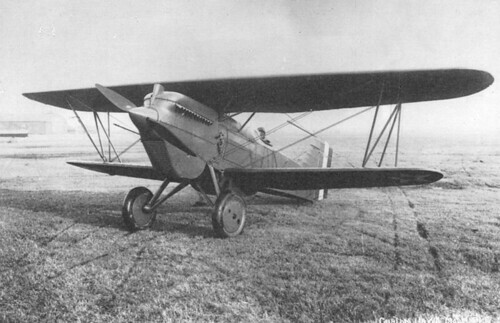 Production version of the XAT-4, 40 ordered, first 35 were converted in 1929 to P-1Ds with the Curtiss D-12 engine, and the remainder completed as AT-5s. Model 34J - five aircraft originally to AT-4s re-engined with a 220 hp (164 kW) Wright J-5, later converted to P-1Es. Model 34M - 31 aircraft based on the P-1B with a lengthened fuselage, later converted to P-1Fs. the first XPW-8 prototype was converted into a two-seat observation aircraft. All variants increased in weight with each succeeding model, resulting in slight reductions in performance with each. Four P-1s were supplied to Bolivia. Eight P-1As and eight P-1Bs went to Chile. One P-1A went to Japan. 1. "US Military Aircraft Designations & Serials 1909-1979 by J.M. Andrade, (Midland Counties Publications, ISBN 0904597229) 1970, 252pp. 6. "Weapons and Warfare volume 12" Editor Bernard Fitzsimons, (BPC Publishing Ltd., ISBN 0839361750), 1978, page 1255. 8. "The Encyclopedia of Military Aircraft" by Robert Jackson, (Parragon Publishing, ISBN 1405424656), 2003, 384 pp.